Yu-Gi-Oh! 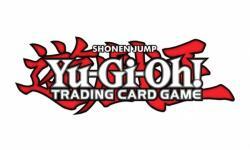 Soul Fusion Special Edition was announced this summer (see �Fusion Summoning Heats Up with New 'Yu-Gi-Oh!' Booster�), and as the December 7 release approaches, the company has announced the two Super Rare variant cards which will be in the package. Players will pull either Summon Sorceress or Isolde, Two Tales of the Noble Knights. The two Super Rare preview cards from the upcoming Savage Strike Booster Set will be Prank-Kids Rocksies and Neo Space Connector.